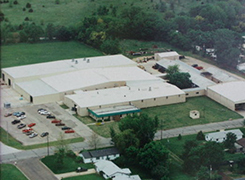 History – LEGG Company, Inc.
At LEGG – from start to finish, top to bottom, inside and out – we ensure that our conveyor belts meet our customers' high expectations. repair shop owner named Ed Toevs. Patented in 1942, the company was called the Rub-R-Slat Draper Co. In 1940 Mr. Ed Toevs formed a partnership with Mr. Everett LEGG. In 1945 Mr. Everett LEGG formed LEGG Company as a marketing branch for the Rub-R-Slat Draper Co. products. In 1952 Mr. LEGG bought out Mr. Toevs for a grand sum of $114,572.57. The company was formally incorporated as LEGG Company, Inc.
the round hay baler in the early 70’s. In 1991 LEGG Company decided to enter the commodity belting market.